Exchange EDB Repair software is a solution for getting back the priv.edb and pub.edb file database into a functional state. The tool repairs EDB file and gives multiple options for easy restoration of the database. Works on Corrupt, Offline, Orphaned Exchange Database File. The tool performs automated scanning of damaged EDB file. However, if the EDB file has intense corruption issues, the tool includes "Advance Scan" mode to fix EDB file that has to be activated manually as per requirement. The shared data within the organization under Exchange environment gets saved in pub.edb file. The software supports public folder repair and export to different files for their better usability in Exchange and other mail clients. The tool to repair mailbox ExchangeÂ® allows selecting folders from EDB file that has to be exported. For this, enable "Selected Folders" option in the tool. However, if all folders are to be exported, choose "All Folders" option. The tool allows adding an EDB file and processes it. This means all mailboxes in the priv.edb file can be repaired in a single running instance of the tool. Emails, contacts, calendars, and other items of the mailbox will be recovered. 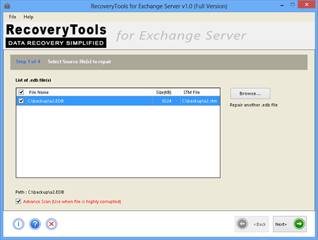 This MS Exchange database repair tool includes the provision to add multiple EDB files for data recovery. However, EDB files can be added one after another. Along with this, there is extended support for repairing Exchange 2000 or 2003 STM file database. The tool to fix EDB file includes facility to sort emails that are saved in EML, MSG, PDF, or HTML file format. A total of eight naming conventions are provided in the tool to sort messages by sender, date, to and by subject. Once the scanning process is done to repair Exchange mailbox database, the tool will give a hierarchical presentation of the data saved in it. Click on "+" button to explore the sub-folders of mailboxes and public folders. 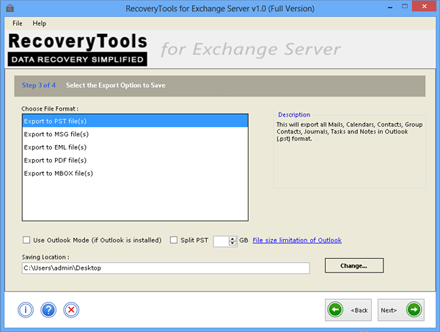 After Exchange server repair database process, the tool gives option to save the Priv.edb and pub.edb items into PST, EML, PDF, MSG, and MBOX file format. This extends access to the EDB database in different mail clients. Exchange Mailbox Repair Tool - A Step Towards Perfection! No matter how hard an administrator tries to develop and maintain a perfect Exchange Server environment, at some point of time, something goes unavoidably wrong. Grounds could be any, hardware or software related or simply inconsistency in the database file. For various reasons that make Exchange database partially or completely inaccessible, there is Exchange EDB Repair tool for help. The tool gives a platform to repair Exchange database dirty shutdown errors, fix logical or physical DB issues, extract mailbox and public folder database into different file formats and much more. No need to dedicated server for recovery in case of Disaster. Repair Exchange mailbox database better than ESEUtil and ISInteg. Single interface for fixing physical and logical corruption issues. Helps in collecting evidences from offline EDB while digital forensics. Give facility to access EDB mailboxes in different mail applications. The software has Graphical User Interface which makes it easy to operate. Moreover, at a time, mailboxes from multiple EDB files can be repaired. The tool has complete support for all versions of Exchange Server (2000-2013) which is exemplified from the fact that both the STM and EDB file repair is possible. The Software works Unexceptionally very well. It repair my EDB file in five file formats as well as it repair my deleted mailbox. Exchange EDB Repair Tool Replies All Doubts & Queries! Does the tool support multiple EDB repair facility? I tried demo version of the tool but I can add only one EDB file while the product help page says that multiple EDB files can be repaired at once". In single go, the software allows adding multiple EDB files. Once you add an EDB file, again click on the "Browse" button to add another file. You have to add multiple files one by one. Can I add Priv.edb and Pub.edb file simultaneously? Yes, you can add both pub.edb with public folder database and priv.edb with mailbox database together to scan and repair Exchange server database in less time. How many mailboxes can I repaired with the tool? There are no limitations for the number of mailboxes that can be repaired with the tool. 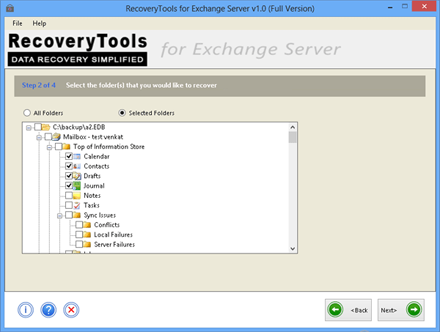 Once activation key of the tool is purchased, you can add as many EDB files to repair mailbox Exchange Server. Definitely, investing in your tool for Exchange Server repair mailbox is time-saving deal. We own site license of the tool and are extremely happy with the performance of tool and support of the technocrats. Due to some hardware issues, some of the employee's complaint about the inaccessibility of mailbox data. We tried this tool to repair corrupt EDB file to get back the mailbox database and it works superbly well.